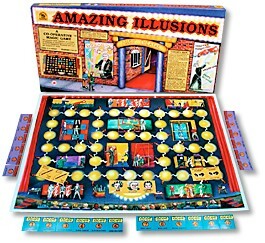 Players are a team of Magicians performing a series of Dangerous Illusions, trying not to get trapped in them. Each game played is the performance itself, full of risks. If something goes wrong, we could fail to carry out illusions â€” or much worse, we could fail to survive. Yes, while the audience gasps in excitement and applauds in delight, we, the Magicians, are forever wondering if tonight is the night we will get caught in our own wondrous Magical Illusions. Includes: 13 x 18" board, manager's chart, magicians, dangers, escapes, and magic power cards.